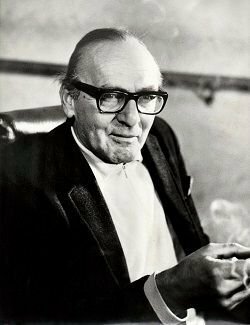 Sanford Meisner (1905-1997) was an acting teacher from New York and the creator of the Meisner Technique. In 1931, a group of young actors, including him, Stella Adler, Lee Strasberg and so on, established the Group Theatre to put “method acting” into practice. However, Meisner found later that method acting was insufficient in creating emotional reality. In order for actors to live “truthfully under imaginary circumstances,” his technique emphasizes impulses and “organic acting,” so that the acting does not become artificial or pre-planned, but is rather active, rich and emotionally truthful at all times. To know more about Meisner, please refer to my journal entries during Emerson's summer program. Harrelson, Charles. "'Sanford Meisner on Acting' – Sanford Meisner & Dennis Longwell." Working Brain Productions, 29 Jan. 2018, workingbrainproductions.com/sanford-meisner-on-acting-sanford-meisner-dennis-longwell/. Accessed 6 Dec. 2018. "Our History." The Sanford Meisner Center, www.themeisnercenter.com/history.html. Accessed 5 Dec. 2018.